Rock 'N Roll Poker Open – David Peters Wins Again! HomeCasino NewsCasino PokerRock ‘N Roll Poker Open – David Peters Wins Again! When David Peters wins a poker tournament, nobody is surprised. People are basically used to it. However, whenever someone wins the same tournament twice in a row, that becomes big news. That is the case for Peters, who has managed to win Seminole Hard Rock ‘N Roll Poker Open (RRPO) tournament once again, creating a back-to-back win! At the moment his lifetime earnings from live poker tournaments have exceeded $30 million. Before he came to Rock ‘N Roll, Peters was in Florida playing the event called Event #16: $5,000 NLH 8-Handed. It had a total of 95 runners who managed to surpass the guaranteed prize of $250,000. In fact, they created a pool of $421,250. A great hand that included William Givens was played on this tournament. 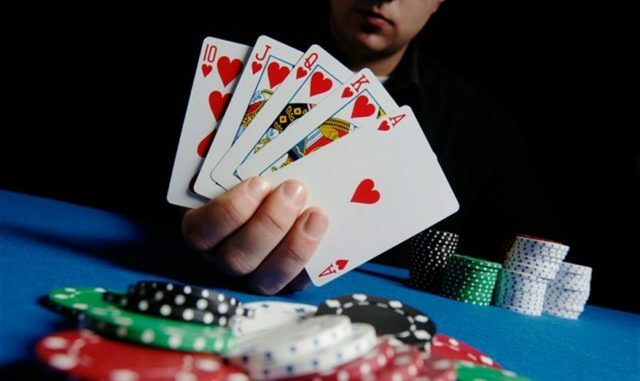 He raised under the gun and decided to bet the flop as well as the river, before he had to jam the river with an Ace, nine, four, King, and Jack. Peters decided to check-call every time with a king-queen and doubled his stake when Givens had to show his card, only to find out that he had six-five. Other names that were included in this tournament but were not a part of the final table are Chad Eveslage, Mykel Comroe, Paul Fisher, and Joe McKeehen. Now, let’s get back to the Hard Rock tournament. Peters won – again. It is his second time in a row to win the same tournament, which is a big deal because not many people have done that in the history of poker. Last year, the tournament also happened in November and there were a total of 61 entrants. Peters managed to win $104,309 back then. This year, he returned to test his poker skills once again – and he even decided to wear the identical shirt that he wore in 2017. In fact, his girlfriend asked him at one point whether that was the shirt which he had worn last year. She also noted that she had bought him the shirt. After basically passing through and winning the tournament once again, Peters stated that it had been a crazy but fun tournament. He also stated that he wore the same sweatshirt and that things had gone pretty well as soon as he had sat to play the final table. However, he added that he had his lows, as he managed to lose a lot of chips at one point. He then started his battle to win them back and succeeded. Not only did he win the chips back, but he also won the tournament once again. His heads-up partner was Scot Wright, and the third place was occupied by a player from Lithuania called Gediminas Uselis. Other players that were a part of the final table were Alexander Timman, Nicholas Shwarmann, Paul Domb, Peter James, and Ray Qartomy.